Two people have been taken to hospital following a road traffic collision, involving seven vehicles on the Magheraknock Road. The incident involved a number of vehicles, the road has now re-opened. A Northern Ireland Fire & Rescue Service spokesperson said: “Northern Ireland Fire & Rescue Service (NIFRS) received a call at 8:27am to a report of a 7 vehicle road traffic collision at the Magheraknock Road area of Ballynahinch this morning (Friday, October 14). 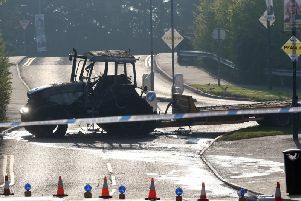 “1 Fire Appliance from Lisburn Fire Station attended to the scene. 2 females and one male were treated at the scene by colleagues from Northern Ireland Ambulance Service and have been taken to hospital following the incident.